When we were picking our top 5 cooperative board games for kids, we had to make sure that every game that we chose could be played by children aged five and up. Let’s just say that wasn’t easy since co-op games can be a bit tougher to grasp for young gamers. Castle Panic, for example, is an excellent family co-op game, but the rules could confuse some younger children. So, without further ado, our Top 5 Cooperative Board Games for Kids! Part of the My Very First Games series, First Orchard is an excellent cooperative board game for young children. It is based on the 1986 game Orchard, but has been redesigned with a simpler set of rules and larger pieces for players as young as two! The game is very easy to understand – you work together to get the fruit before the raven does – but it also holds a child’s attention. Rolling the large die and matching the colors in this way is very entertaining for kids (and their parents! ), so it has immense replayability. It is very rare to find cooperative kids games for ages two and up, but First Orchard is just that. It teaches both teamwork and color recognition, which are both extremely important in childhood development. Get your copy of First Orchard here! Produced by award-winning publisher Gamewright, Outfoxed is a co-op board game for kids that has players attempt to figure out which fox stole a potpie. Throughout the game, clues and suspects are revealed, and players try to find the right suspect before they get away. Children absolutely love this game because there are multiple mechanics that are both cool and easy to understand. The most popular of these mechanics is the clue revealer, which shows players if they got a clue that matches a hidden suspect by revealing either a green or a red mark. From the mechanics to the artwork, there is a lot to like about Outfoxed. We really like that each player reveals his or her own clues, but the only way those clues can help them is if they get help from their teammates. Outfoxed has considered by many to be one of the best board games for toddlers ever since it came out and it’ll probably be on this list for a while. Get your copy of Outfoxed here! Wildcraft! An Herbal Adventure Game is a cooperative kids game that has players attempt to collect herbs so Grandma can make a pie. It’s way more than that, though! While they are out collecting, players have to help each other by using edible and medicinal herbs to make it back to the house in good health. Wildcraft! 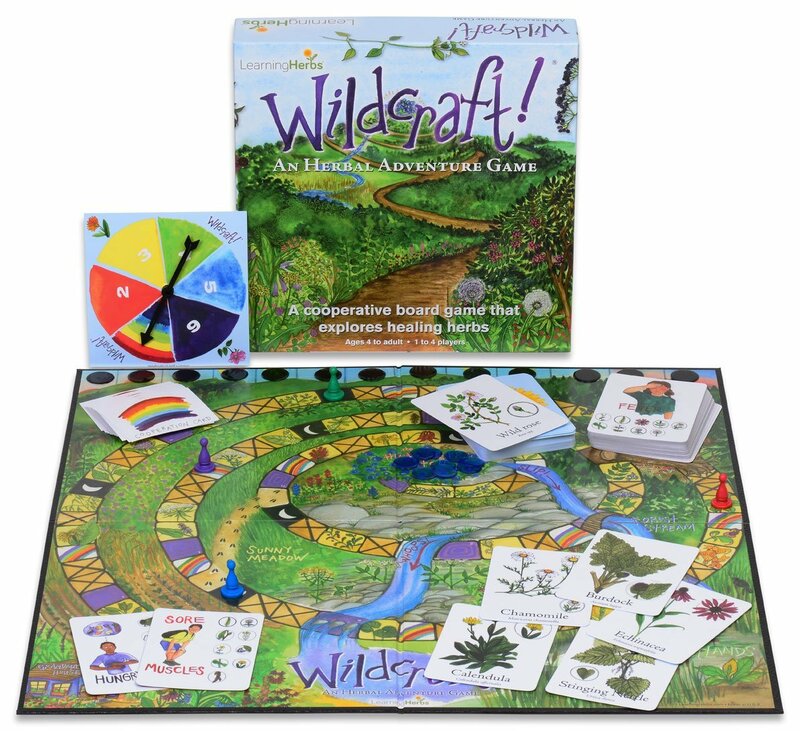 features a beautiful board and cards that will both educate and entertain. Players have to recognize when they have a card that will help out their teammates to increase their chances of winning; this is made easier by the matching symbols on different cards. One thing that makes Wildcraft! one of the best children’s board games is that it is educational without being boring. Kids learn a little bit about nature in a gaming environment, which increases their chances of retaining that information. 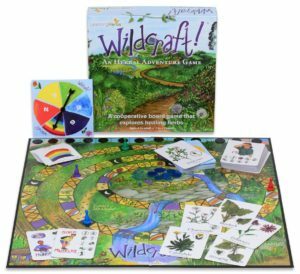 Get your copy of Wildcraft here! 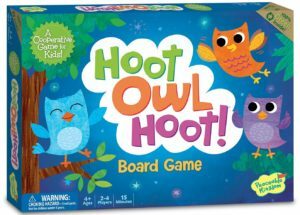 Hoot Owl Hoot is one of the most popular children’s games out there right now, and for good reason. It is a pattern recognition board game that has players attempt to get every owl on the board back to their nests before the sun comes up. Hoot Owl Hoot has a bunch of fun little elements to it. Not only do players work together to try to help the owls, they also get to make a “hoot” sound whenever one owl passes another. It makes for a very entertaining board game and one that kids will enjoy working together on. Hoot Owl Hoot has great replayability because you can add in more owls if kids start to figure out the patterns. It also has fun artwork on the board and the cards, which is why most people agree it is one of the very best board games for kids. Get your copy of Hoot Howl Hoot here! 1. Race to the Treasure! 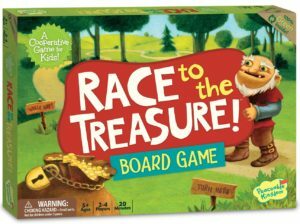 Race to the Treasure is a tile placement game that has players race an Ogre to a treasure chest. While they are trying to find their way to the treasure, players have to locate three keys so they can open the chest once they get to it. The main mechanic of Race for the Treasure is placing tiles. There is no reading to do, but players must be able to connect those tiles in a design that allows them to get to the keys and the treasure. 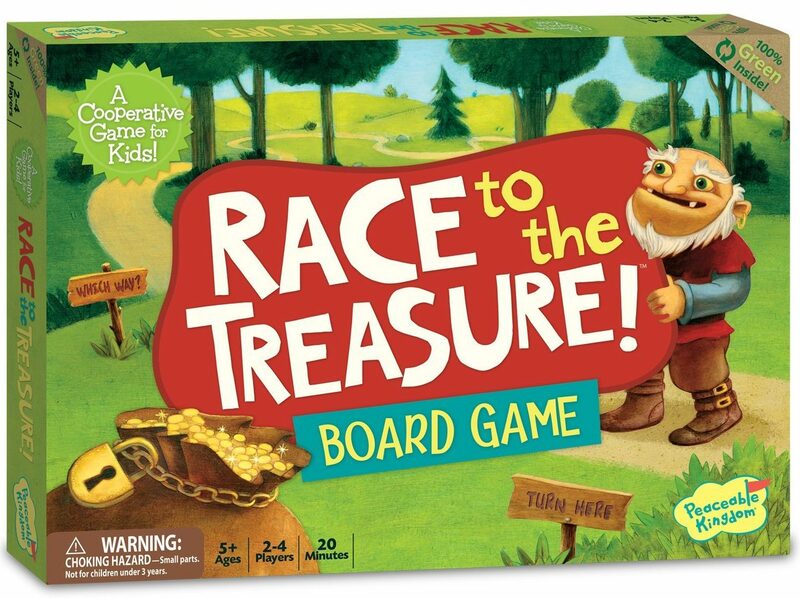 What we really like about Race for the Treasure (and one of the reasons it’s the best) is that it has kids work together to find a way to a common goal (the treasure). There is light strategy in the game, but it is enough to keep kids very interested until they either win or lose the race. It’s not surprising at all that this has been one of the most popular cooperative kids games for the last few years. Get your copy of Race to the Treasure here! These didn’t quite make it into our top cooperative board games for kids, but they’re all excellent games! Stone Soup – Stone Soup is a memory game for kids 5 and up. Players work together to find matching ingredients on the game board so they can make some soup! Secret Door – Secret Door is an excellent cooperative game for ages 5 and up that has players search through a mansion to find stolen valuables. It is a game of both memory and logic for the whole family! Mermaid Island – Designed for girls 5 and up, Mermaid Island is a strategy game that has players attempt to help mermaids swim back to the island before a witch shows up. There is some very nice artwork in this one and it requires a good amount of social interaction. What are your favorite cooperative board games for kids? Let us know in the comments!